Diary 13th July LR 110 CSW WRITES: Happy birthday to me, happy birthday to me, happy birthday dear LR with no name, happy birthday to me! I am now one year old and have covered 25000 miles (20000 on this trip) I have used 952.74 imperial gallons of diesel (about 4334.96 litres for the metricphiles amongst you) from my birth for an average of 26.24mpg (not bad considering I weigh nearly 3.5 tonnes all up although if I manage to ditch that Ashley character I’d be closer to two tonnes). I guess the cost of fuel has averaged about $1 per litre (about 54 pence) from the highs of £1 per litre in the UK and 95p per litre in Turkey to about 13p per litre in Syria and around 8p per litre in Egypt. Although all these figures could be wrong as in Mozambique Mr BP managed to squeeze198 litres of diesel into a nearly empty 158 litre tank….smaller litres there maybe? (Or an American litre??) My plan is to use as much fuel as possible before George Bush gets it all, besides, the sooner we use up all the oil the sooner I can be fitted with a nice clean non-polluting fuel cell! I have used no oil and have never broken down or failed to start (touch a bloody big piece of wood) My friend Mr Garmin the GPS thingy says we are 5885 miles as the crow flies from Bath. Seems very close and if there was a road directly home I could be there in two weeks. I’ve had three punctures during my trip and gone through two rear shock absorbers, had a problem with my roof rectified under warranty by Land Rover South Africa and survived (so far) the atrocious standard of driving in SA. I think the main reason is that South Africans are under the impression that accelerators have two positions, off and on. As the cars here are all modern new things they pass me at 140-160 kph. I cruise at about 100-110 kph (60 to 70mph) but even the trucks are overtaking me at this speed! The rest of Africa might also become like this when they start repairing their roads and replacing their speed challenged Series II LRs with more Toyotas, BMWs and Mercs. 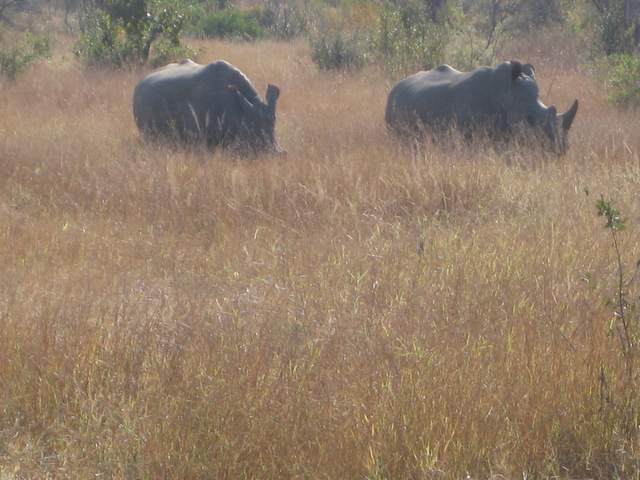 PIC SHOWS: MY MATES, THE WHITE RHINOS.